The Christmas of 1998 was a hectic one. 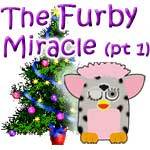 Mothers from around the U.S.A scrambled to stores in hope of buying a Furby for their child in time for Christmas. Security was called in to guard stores supplying Furbys and mothers were beating each other off with sticks. Yes it was a crazy winter but it would soon all be over. The day was December 25, 1998 and 6-year old Amy sat by the big old Christmas tree and gazed at her few presents. Her parents looked hopeful and Amy didn’t know what to think. Amy’s family was poor. Not live-on-the-streets poor, just not rich. Amy reached for a square-looking present and slowly unwrapped it. She tore back the paper and revealed one simple word. Furby. Her face lit up like a light bulb on a Christmas tree as she anxiously tore open the rest of the box. She pulled out a grey and pink Furby with black spots. Amy jumped up and down in joy and shoved the box at her parents, “Open it!” Her parents looked at her. “I’m sorry.” She ran to give them a hug. They hugged her back. “Thank you mom and dad. Thank you so so much!” She opened the last present, revealing a small box of batteries.